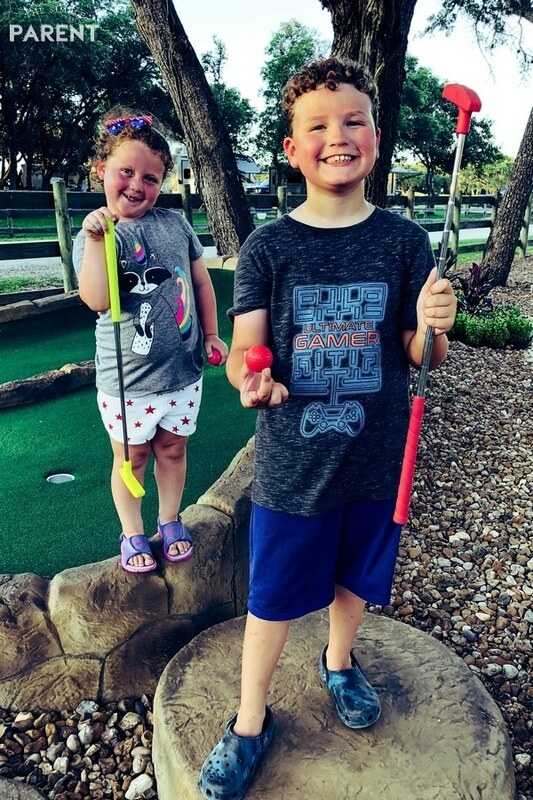 We partnered with Splashway Waterpark this summer to experience the waterpark and campground located in Sheridan, Texas. All thoughts and opinions are my own but I’m excited to share about our great experience! 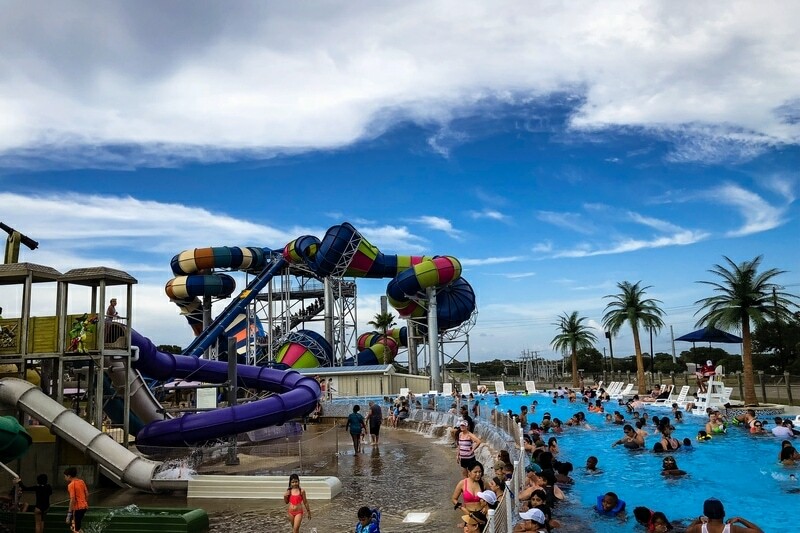 If you’re in the Houston area and you’re looking for a fun getaway just a short driving distance away, Splashway Waterpark is definitely one destination to put on your radar! Splashway is a waterpark and campground located in Sheridan, Texas. It’s located about one hour west of Katy, Texas on I-10. From The Woodlands area on the north side of Houston, it took us a little under two hours to make it to Splashway. 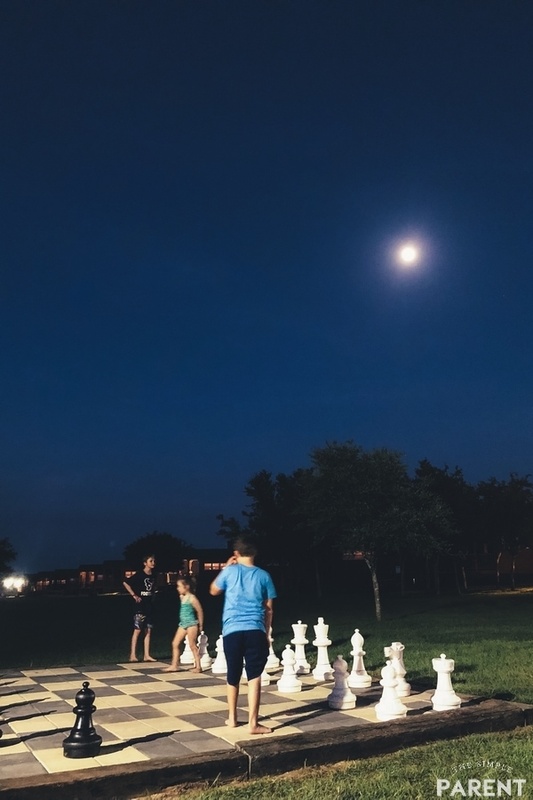 It’s a great staycation destination if you live in the Houston area! I think it’s also worthy of longer travel too! 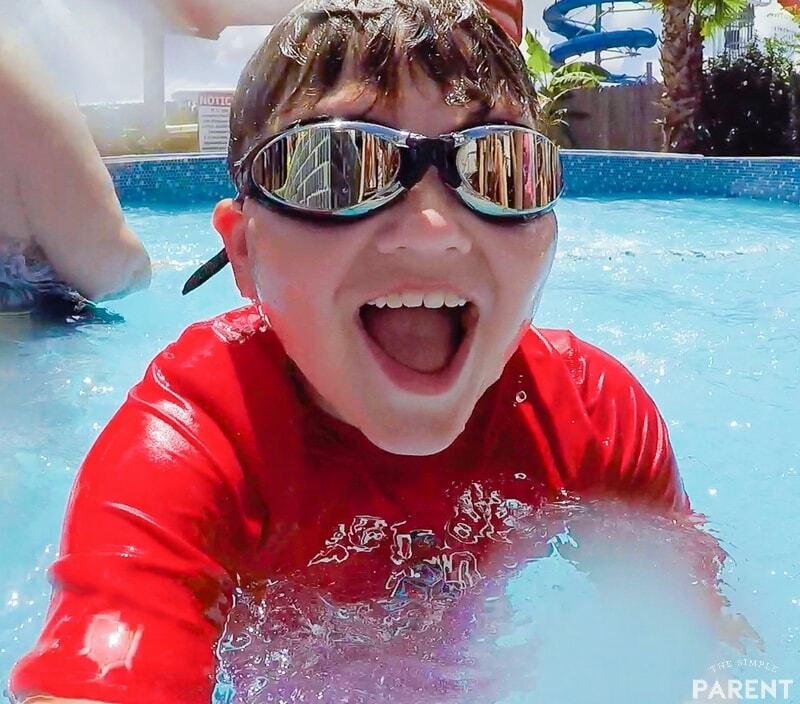 We spent a few days at Splashway enjoying the water park and staying in one of their awesome cabins! Would we visit again? DEFINITELY! The kids are still talking about our trip! 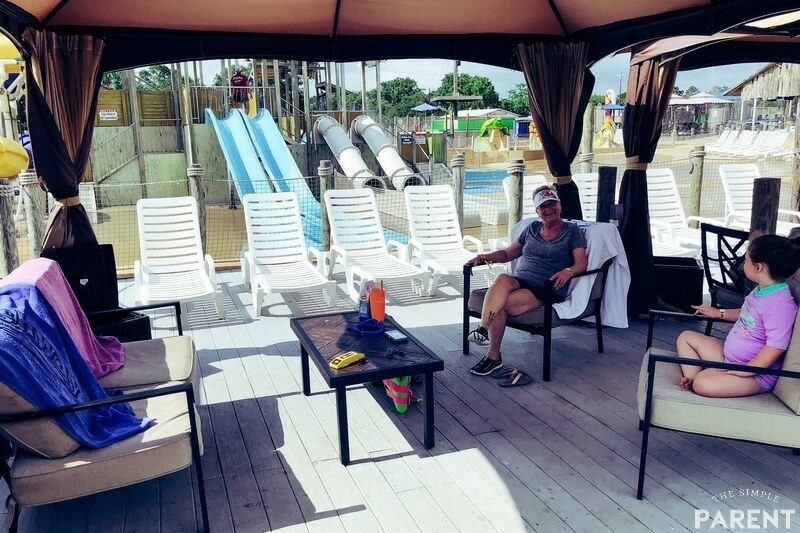 It was hard to narrow down our list, but there are four reasons we all agree that you should take your family to visit Splashway Waterpark and Campground soon! 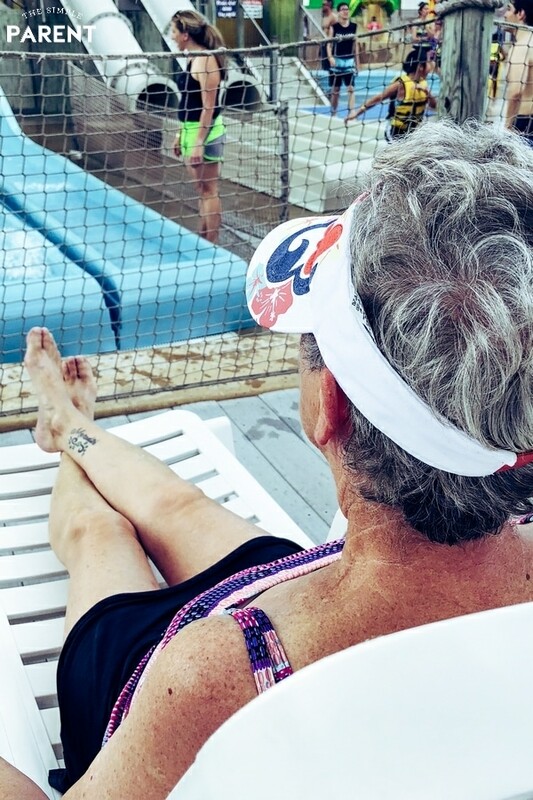 My favorite thing about Splashway Waterpark is that it really is fun for all ages! From the youngest toddlers to the teenagers and adults looking for a thrill, Splashway has attractions for the entire family. My kids fell in love with the Kids of the Caribbean area. It’s the largest kid area in the park and offers a mix of splash pad fun and waterslides! The area has 14 waterslides and 3 huge dumping buckets along with plenty of fountains! I loved that while the kids were playing in the Kids of the Caribbean area I could sit in a lounge chair or even float in the lagoon pool right next to the area. I could see the kids the entire time! There are other areas in the park for the younger kids too where they can play, splash, and explore the water. For the older family members, Splashway offers a ton of different water slides that range in intensity. Weston and Carrigan both rode down Hurricane Hill, smiling the whole way! Weston and I enjoyed Midnight Storm which was Splashway’s first tube slide! You go through twists and turns in the pitch black tunnel! For the thrill seekers, Splashway has Ray’s Riptide and the Loco Mono! You’ve got to check them out if you love twists, turns, and drops! Oh, and we can’t forget the wave pool. We spent quite a bit of time in that pool! 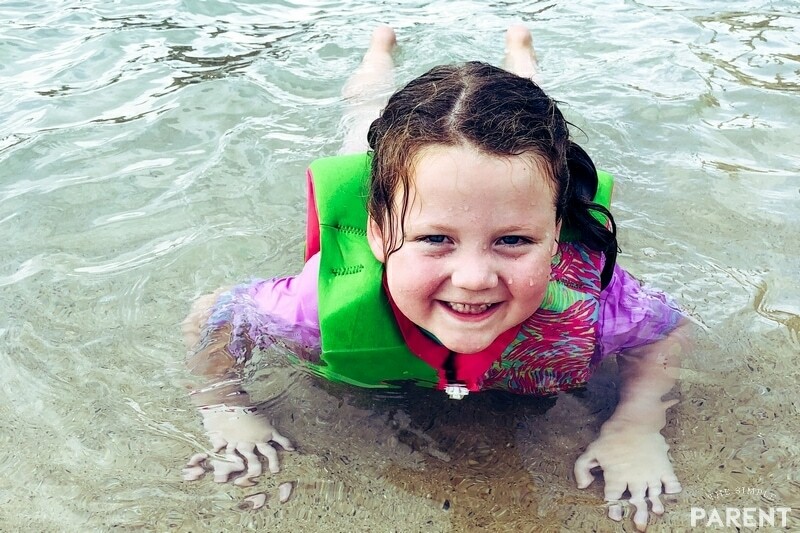 Plus, Splashway has life jackets and tubes available for everyone — free of charge! 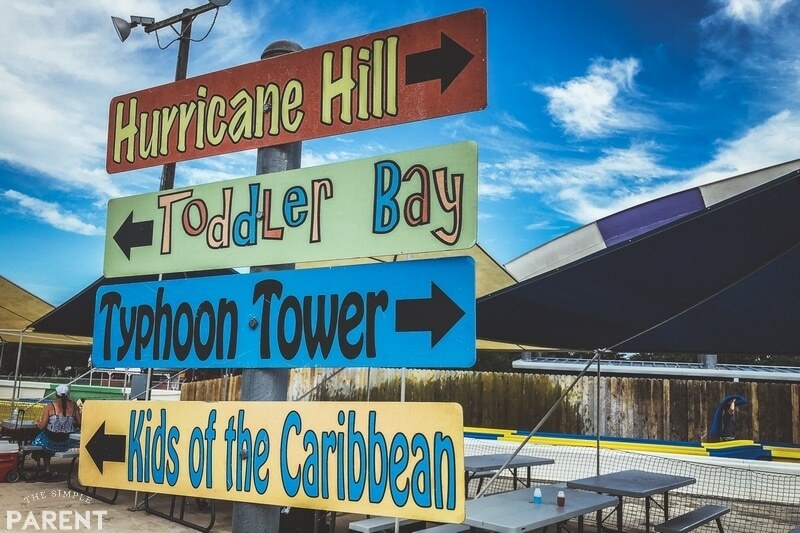 Learn more about all of the Splashway Waterpark attractions and plan your trip! We were lucky to have the chance to experience the private cabanas located throughout the waterpark. You can book them in advance of your trip or see what is available when you arrive. 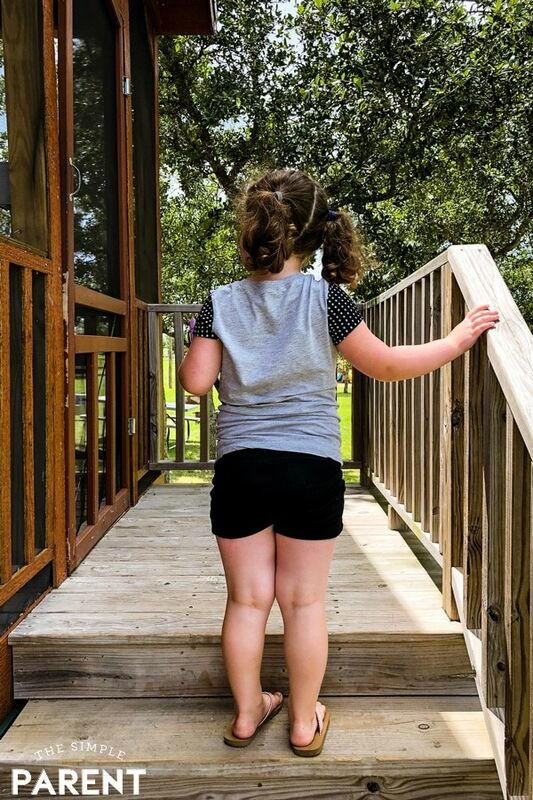 While there are plenty of tables and umbrellas located throughout the park, having a private cabana made our experience even better for me as a mom. I loved having a central location that was out of the sun (and out of the rain on the day when it rained on us) where we could take a break. Playing in the water wears my kids down pretty quickly so being able to relax and put on more sunscreen in the shade was wonderful. We haven’t done a lot of waterparks with the kids because of the logistics of all of our stuff and having the space to make it an enjoyable experience when we weren’t in the water. Splashway Waterpark changed that for me! I will gladly visit again and take advantage of the private cabana offerings. When Splashway reached out to offer to host us for a stay in a cabin, I wasn’t sure what to expect. As an adult, camping isn’t really something I have a lot of experience doing. We had our first family experience last year and put together a basic family camping checklist. But a cabin sounded like something I could do. 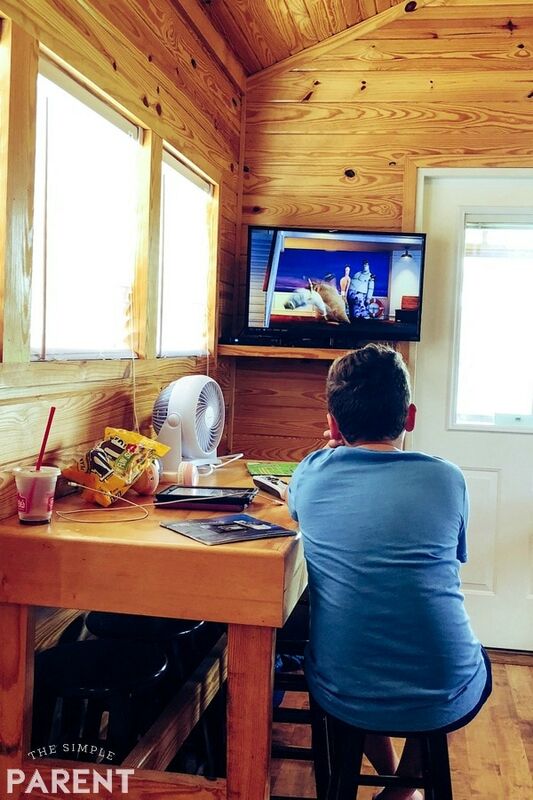 Staying in a cabin at the Splashway Campground has been one of our best travel experiences! When you stay in one, it’s not going to be a rustic cabin experience, it’s more of a tiny house experience. With three generations staying together, it was perfect for us! Each cabin includes a bedroom with a queen sized bed and a loft with four beds. Yes, 4 beds! There was plenty of room for us to all sleep. Justin couldn’t come with us but there would have plenty of space for him too! Grambo took the bedroom while I stayed in the loft with the kids. They loved the loft factor. They’ve given it a high honor as one of their favorite hotel rooms they’ve stayed in. I loved that we have a full bathroom and fully furnished kitchen with a microwave, oven, and refrigerator. Oh, and we had satellite TV and AIR CONDITIONING! All the comforts of home at the campground. It was the best of both worlds. Plus it only took a few minutes to walk to Splashway Waterpark each morning! The one thing that the campground doesn’t have is Wi-Fi. They’re working on it though! It’s nice to be able to disconnect, but if you like to read or watch movies, be sure to download a few things before you arrive! My cell coverage was phenomenal during our visit but I know not all carriers are the same. There are a variety of different accommodations available at Splashway. 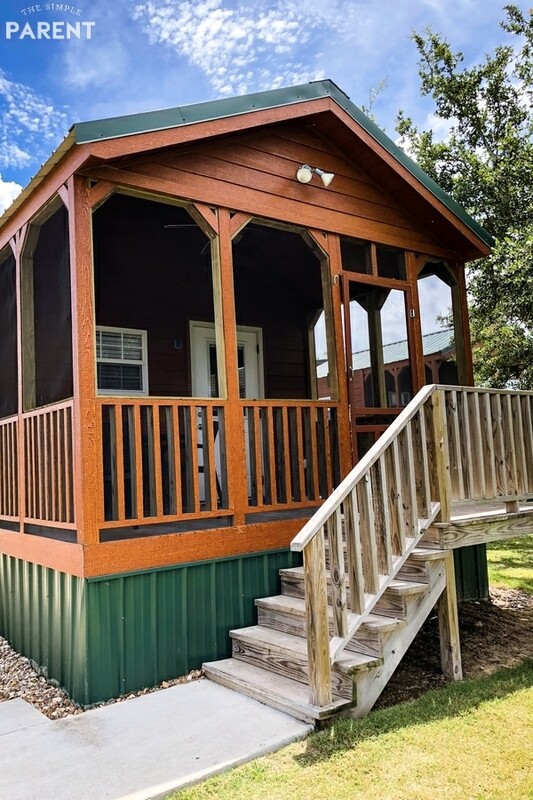 Learn more about the cabins and the other options on the website and find one that works great for your family! 4. 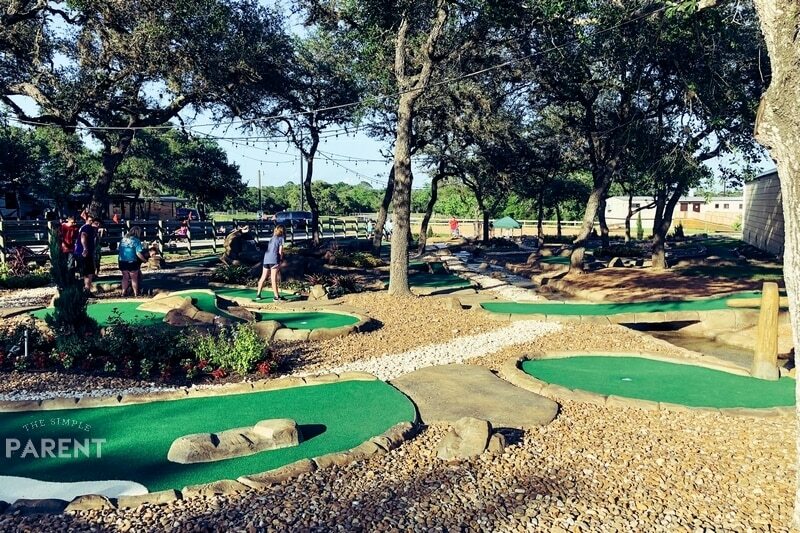 Mini Golf, Laser Tag, and More! The Splashway Campground amenities and activities made our visit into a fabulous staycation! The campground has activities planned each night so you can check out the schedule and see what’s happening. You can also play laser tag and mini golf for a small fee! Weston was thrilled when he had the opportunity to do both! I’m pretty sure all of his summer dreams came true on this trip! The campground has a fishing pond, hiking and biking trails, kayaking and pedal boats, volleyball, basketball, and playgrounds! We took advantage of the smaller playground that was right by our cabin. Sitting outside in the quiet evening, making new friends in the cabin next door while the kids played together is something I’ll never forget. Sometimes the best memories are made in those quiet, unplanned moments. There’s also a camp store that has all the basics covered in case you forgot anything or you’re craving a little treat. 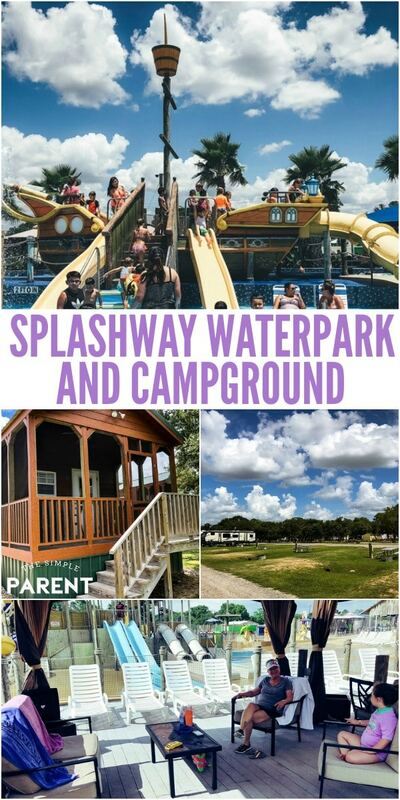 If you’re looking for a staycation option in the Houston, Texas area or for a stop while road tripping through the state, Splashway Waterpark and Campground gets two thumbs up from us. It’s a bit of a break from the norm and a great place to make memories and get away from it all! 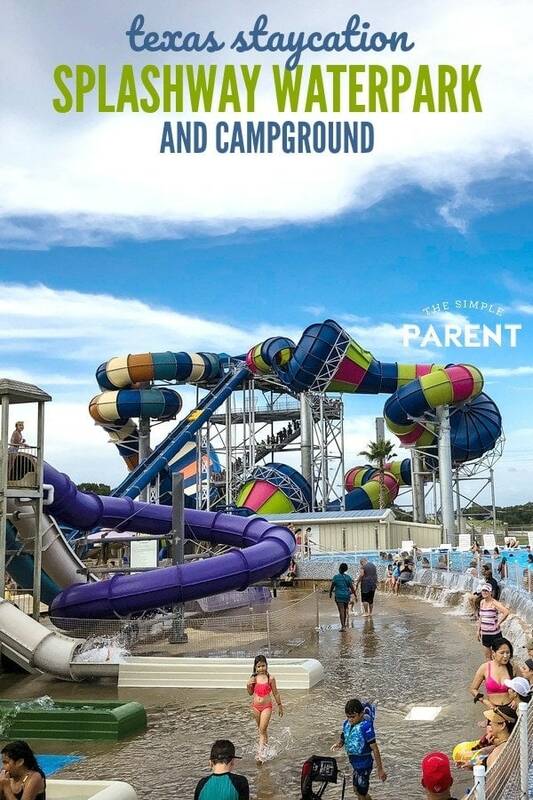 If you’re planning a visit to Splashway Waterpark & Campground this summer, you can save $5 off a full-priced waterpark ticket by using the code SimpleParent. The code is valid through August 31st so get your tickets before the summer is over! Learn more by visiting splashwaywaterpark.com!